Wow!! Have you ever seen this? I haven’t until over a week ago. I’ve been traveling again and I visited a candy factory in Spain and was very surprised about this canister of tennis gum balls! 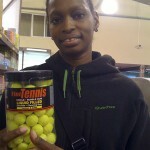 They are gum balls with the color, shape and design of a tennis ball. Even the texture looks about the same. The gum balls are liquid filled with lemon and lime flavors. I did not buy the canister but I should have, however I would have been the only one eating them. 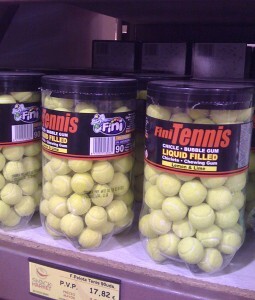 The canister contains 90 tennis gum balls. If you take a good luck the container is shaped just like a normal tennis ball canister. I’m a big big tennis fan and I love playing tennis in my free time so this just shocked me. I had never seen anything like this before in the USA. After a little research I found out that the company is from Spain and creates all sorts of candy for sports like football (American soccer). Here is the website Fini. The website is in Spanish and French so go through a website translator like Google if you are having problems with the language. 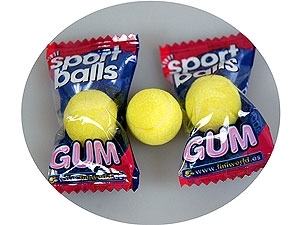 Also, what I didn’t see at the store were individually wrapped tennis gum balls like I’ve found online which retail value is 0.05 euros. The canister of 90 gum balls were retail valued at 17.82 however in the store and online I’ve seen it price as low as 14.00euros. This is a great idea and it would be great for any tennis coach to get their players motivated or rewarded before or after a match. Candy is always fun. Also as a fundraiser as well selling the individual packages could deem rewarding! 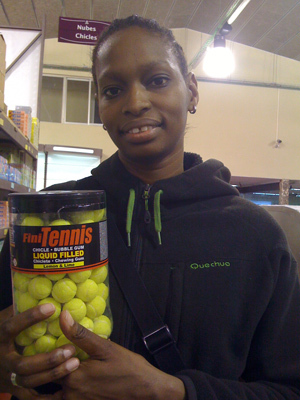 Here are the websites that offer the Finis Tennis Gum Ball Canister.